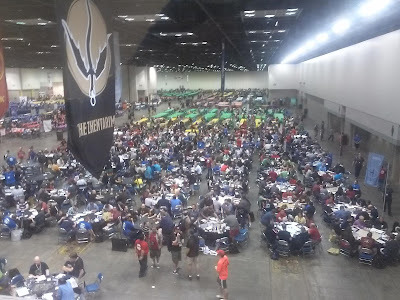 Last Saturday, my "D&D Epic" was held at GenCon Indy! Hundreds of players cooperated in a single multi-table event to save the Moonsea from a demonic ritual. Adventurers were separated by level into three tiers, with each tier playing a different "track" of the same mission. In the end, they successfully foiled the ritual - though the high track failed, the low and mid tracks triumphed. It was a huge honour to write this one, and I had great fun designing it (mixed with some terror). My watchwords throughout were "Make it Feel Epic", and I think for the most part I succeeded in that. The low track featured naval combat in a flooded arena, while the mid track saw players infiltrate a drow outpost on the backs of cloakers. The high track was possibly my favourite, where the adventurers did battle on giant spider mounts inside an Underdark Colosseum. I wish I was there to see the event being played, but hey - it's the other side of the world! How do you design an event that feels interactive, while keeping the administration of that event manageable? How do you support players of varying experience levels? How do you make each table contribute towards a shared goal? "I want to feel like I'm part of an epic group endeavour with clear goals"
"My table's actions should affect other tables in transparent ways"
"The challenge should be greater than usual, with opportunities for epic loot"
"If my table performs well it should be recognised and rewarded by the event as a whole"
"There should be ways to help out tables in need"
"I want access to player options that aren't normally available"
"The event should feel special somehow, either through unique props, handouts, actors, music or lighting." "My table's actions should never invalidate the contribution of another table or shut down an encounter in progress"
"I want to run the adventure with minimum - if any - prep"
"I want clear guidelines on how to modify difficulty on-the-fly without it feeling contrived"
"There should be a simple way to relay messages to and from HQ without halting play"
I have some ideas for improvements, but first I'd be interested to hear your views on the matter. I know that the Adventurers League itself is always looking for ways to improve these events. So, did you play "Blood Above, Blood Below" on Saturday night? What did you like or dislike? Which Epics (or "Battle Interactives") have you enjoyed in the past? What made them so great? I've played many DnDAL modules and your adventures stood out so much that I looked you up, but found a very low profile, just some posts to the AL FB page and this blog. Anyway, your modules are detailed and professional and not half-assed. Plus, you really give DMs a complete adventure, with options, and things to go beyond the module with or not. Anyway, I'm going to link your blog on my league group page and I hope to play one of your epics someday. Thank you! Looks like my next Epic is going to reach quite a few more conventions than the last one. Hopefully there will be one near you. I found your blog from Mind Blast! From here I saw you did AL, and I've been collecting all the adventures you did to run them. Yours are a cut above the others, for sure. I could gush about all the things you cleverly do well, but you probably understand your design philosophy better then I. If you have trpg products for sale, I would buy them! I'm hoping to put together some things for the DMs Guild over the next few months. I'll post here if I do! I draw maps and write adventures. My girlfriend Stacey is an artist and illustrator. Together, we bake Beholder Pie.